This site is owned and controlled by Bird Rock Systems, Inc., hereafter referred to as ‘Bird Rock Systems’, 'we', ‘us’, or ‘our’. By accessing this site, you acknowledge the terms and conditions set forth herein, as well as applicable law. Bird Rock Systems reserves the right to change this policy from time to time, without notice and at our sole discretion. In general, you may visit the Bird Rock Systems web site without telling us who you are or revealing any personal information about yourself. We track visiting domains, internet addresses of the domains from which people visit us to track a user’s session. The user’s browser also lets us know what type of computer and operating system is being used. This allows us to analyze the information as to which parts of our site users spend their time and their length of stay but does not give us any personal information about the user. More specifically, a user’s session will be tracked, but the user will remain anonymous. Sometimes however, we will ask you to voluntarily provide information about yourself, such as when you subscribe to our newsletter, request a quote, sign up for a mailing list, fill out a contact form, leave a comment, or view or download a resource. We may occasionally use this information when we notify you of important changes to the site. Bird Rock Systems does not collect any personally identifiable financial or health-related information. However, you may be asked to enter your name, e-mail address, mailing address or phone number. If you do not wish to provide the requested information, you may not be able to complete the applicable transaction. We implement a variety of security measures to maintain the safety of your personal information. 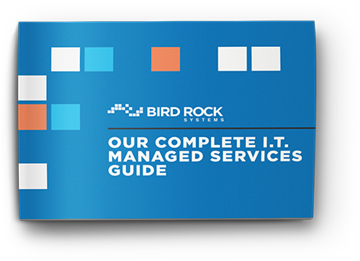 Bird Rock Systems uses industry-standard controls including physical access controls, Internet firewalls, intrusion detection, and network monitoring. All personal information is transmitted via Secure Socket Layer (SSL) technology and then encrypted. Only authorized administrators and staff have access to systems containing such information. Backup data are securely stored and not shared with any third parties. WHAT IS BIRD ROCK SYSTEM’S POLICY REGARDING THIRD PARTY LINKS OR LINKS TO OTHER WEB SITES? Bird Rock System’s site may contain links to other sites on the Internet, which are owned and operated by Bird Rock System’s partners, customers, advertisers, and other third parties. These third party sites have separate and independent privacy policies which have not been reviewed by Bird Rock Systems. We therefore have no responsibility or liability for the content and activities of these linked sites. Nonetheless, we seek to protect the integrity of our site and welcome any feedback about these sites. Because Bird Rock Systems values your privacy we have taken the necessary precautions to be in compliance with the California Online Privacy Protection Act. We therefore will not distribute your personal information to outside parties without your consent. This policy was last modified on August 30, 2012.